In Defense of Democratic Capitalism by Charles M. Kelly is licensed under a Creative Commons Attribution 3.0 License. Note: This website is no longer being updated. Efforts are now devoted to the new website at Defend Democratic Capitalism! Of course, the conflict between investors and workers never ends and the issues are timeless—so feel free to browse here anyway. It’s time we got back to the kind of democratic capitalism that actually made America the great country that it is. Right now, we have a government that lacks the values that are necessary for a civilized society: respect for honest work, decent pay for those at the bottom of our economy, adequate health care and a decent education for all, and so on.. Check out previous week's top issues. A classic two-minute video demonstrates how conservatives deliberately lie about economic issues. ROOSEVELT: Born into wealth, yet became the most progressive president we've had. His detractors called him a socialist, or possibly communist, and a "traitor to his class." TRUMAN: The common man as president who was willing to defy all the political "experts" and pollsters, and to speak the truth as he saw it. They were willing to repeatedly and strongly refute the economic and social absurdities of their opponents. They didn't let themselves get distracted from important issues and they let no outrageous attack go unchallenged. They recognized that educating the public was an important part of their leadership. Check out why Class War in America was written. It can be obtained at Amazon.com or Barnes and Noble. Used copies are widely available on the internet. However, you can download the book free by going to Class War in America: the book, or from Google Books. They exposed right-wing conservatives to the public for being the demagogues they were. Their political opponents were closet aristocrats who pretended to represent the interests of the general public, when they actually represented the interests of investors and the established wealthy. Check out whyThe Great Limbaugh Con was written. It can be obtained at Amazon.com or Barnes and Noble. Used copies are widely available on the internet. It also can be downloaded free from Google Books. They were proactive leaders who believed in the objective analysis of problems and in establishing priorities. They resisted the pressures of special interest groups and gave the voting public confidence that they knew how to make government work for them. Check out whyThe Destructive Achiever was written. It is out of print, but is widely available on the internet. It also can be downloaded free from Google Books. 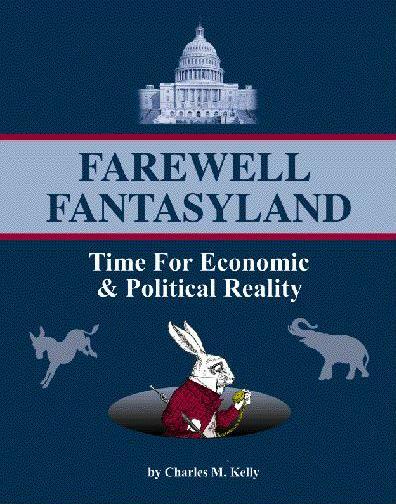 The illustrated Farewell Fantasyland frames new arguments about important controversial economic issues in a manner that will appeal to well informed readers, as well as to those who don’t normally read nonfiction books about political economics. Historical precedent, statistics, and current events overwhelmingly favor traditional liberal economic policies. Why, then, are liberals having so much trouble getting their message across? It’s all in how they are framing their arguments, and in their reluctance to confront, head-on, significant public biases and misconceptions. The Conservative Financial Press. Find out what conservatives really think, when they don't know you're looking. From January 3 to April 1,2005. From April 4 to July 1, 2005. From October 4 to December 27, 2004. From July 5 to September 27, 2004. From April 5 to July 2, 2004. From January 5 to March 29, 2004. From June 2 to September 29, 2003. From October 6 to December 29, 2003. Why Are There So Few Roosevelts and Trumans Today? They've been bought-off by the same special interests that already own the Republicans. They've been conned by Republicans into believing that the only way to win is to steal the Republican's agenda—as Clinton did. They've actually succumbed to the simplistic economic and social slogans of America's well-financed conservative think tanks and propagandists. The first reason is obviously valid, as the records demonstrate. There's not much we can do about that, except make sure that politicians who are not on the take win in the Democratic primaries. And when an incumbent Democrat proves by his voting record that he has been bought-off, make sure he doesn't get the chance again. The second two reasons are tougher and the focus of this web site. One of the great mysteries of the universe is why Democrats take the advice given by Republicans. When the Rs say that they would be delighted if Ds took up the "class warfare" issue, shouldn't the Ds be suspicious? Isn't it likely that they are terrified at the thought that it could become a prominent election issue? Sure, the U.S. has become a very conservative country, but it's not because of the conservatives' record, or because their philosophies and strategies are right. It's because they have successfully distorted important economic and social concepts, and not enough knowledgeable Democrats have been willing to call them liars. High incomes and tax cuts for the wealthy are good because they create jobs. Wage increases for workers are always bad because they cause inflation. Corporate profits are good. Legislative protections of working conditions are expensive, benefit primarily workers, and are therefore bad. Economic growth is good, as long as it increases corporate profits. Economic growth is excessive—and bad, if wages start to go up. The Chamber of Commerce and the National Association of Manufacturers are good for American workers. Labor unions are bad for them. Globalization is good for everyone, investors and workers alike. And so on, as is covered throughout this web site. Public acceptance of nonsense like this has led to the greatest wealth and income gap since the Great Depression, which is not a good sign for the future. Too many Democrats have decided that the way to win elections is to act like moderate Republicans. As a result, they have abandoned their core—working Americans. They were able to win elections, but now they feel they can’t get reelected if they don’t vote with the Republicans in bringing Congress to an effete standstill. However, if present trends continue, and the economy continues to benefit bankers and the established wealthy—at the direct expense of working Americans—it should be much easier to pound some sense into American voters in time for the 2010 elections. Go to the Two-minute video page. Email your comments, suggestions or criticisms. Also check out an excellent new book about America’s disastrous adoption of free trade without a sensible industrial policy. It is Free Trade Doesn’t Work, and is written by Mr. Ian Fletcher, an Adjunct Fellow at the US Business & Industry Council.